On Friday September 16th, 2016 our sweet girl Sally farrowed her very first littler of piglets! 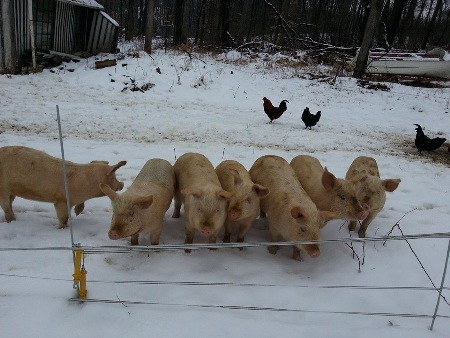 Sally gave birth to 9 healthy and happy piglets right here on M&M Creek Valley Farm! 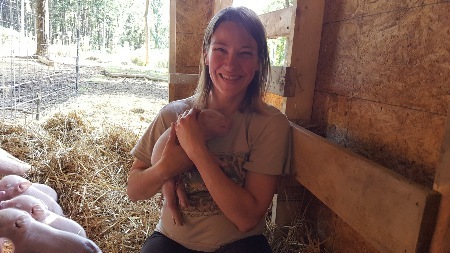 Megan and little Marty attended the birth and assisted the piglets until big Marty made it home, after piglet #5 made her appearance! 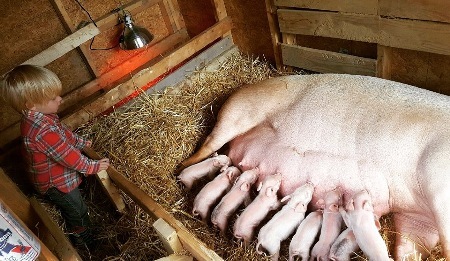 After 5 exhausting days of checking the babies every hour to 2 hours so they could nurse and not inadvertently be squished by big Momma, Marty was able to allow them to nurse on their own. All is well, everyone is growing and thriving, and Sally is an AWESOME Momma!! 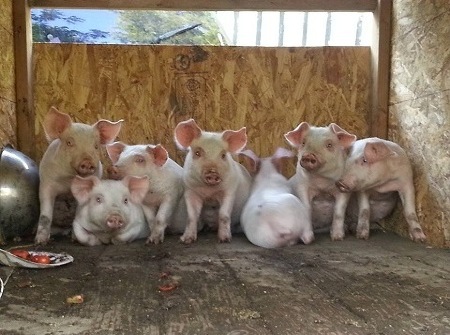 As of mid September 2014 we are raising Yorkshire pigs. 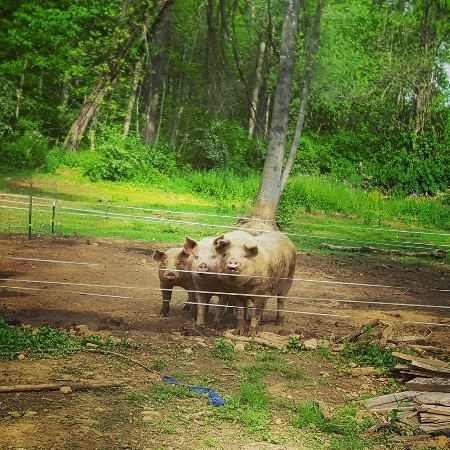 We decided to add pigs to our farm because we love pork and wanted to know exactly how the meat we consume and give to our son is raised, fed and harvested. 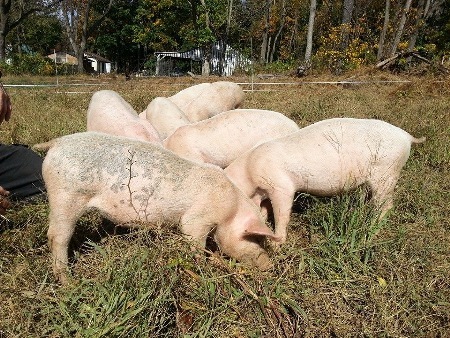 We give our hogs access to managed rotational pastures as well as GMO free grain, to ensure the happiest and healthiest pigs possible in a natural setting in order to provide the best tasting pork possible at reasonable, competitive market prices. 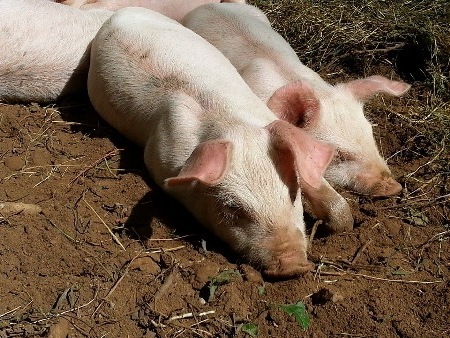 Our hogs are never fed swill (also known as "kitchen" or "food" scraps). 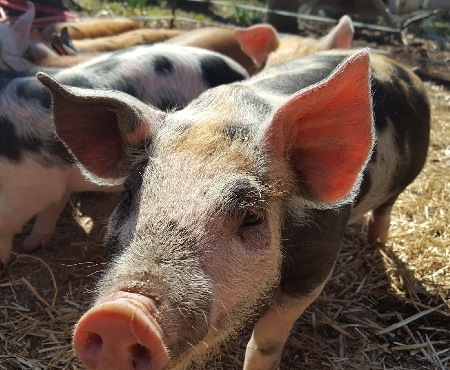 We believe in the old saying "You are what you eat" and our hogs are a part of our family..
New piglets arrived on the farm in April 2016! 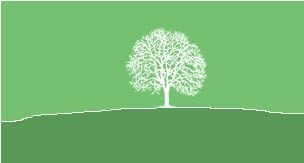 Farmer Kennedy is working smarter not harder, check out the new feeder! 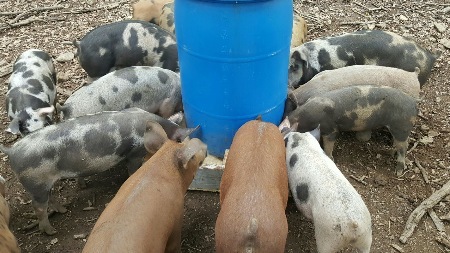 The pigs seem to like it! June 2016! 9/17/2014 The day our first hogs arrived on the farm. 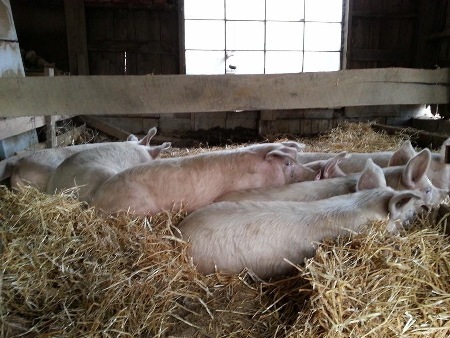 Afternoon nap in the barn on a sunny afternoon in early May 2015!